When your day is bookended by a must-have cup of dark-roast coffee in the morning and a must-have glass of red wine in the evening, you might find yourself wishing your teeth didn't look so dingy. What are your options for whitening? Strips from the drugstore? Tried 'em and didn't have the discipline to use them every day until they sloooowly made a difference. Shopping mall kiosk? Laid there for 90 minutes in an uncomfortable position with a tech who seemed untrained in using the UV lamp that, for all I knew, was radiating me in ways I shouldn't be radiated. Dentist's office? Did that, too. It required $$$ and more than one trip to get the molds made and delivered to me. Here's a teeth-whitening option: SmileBrilliant does what the dentist's office does, but I don't actually need to go into the dentist's office. The price is $120, and SmileBrilliant is giving away one set -- a kit to create upper and lower trays, as well as 3 syringes (which equates to 9 applications of whitening gel) to a randomly chosen commenter. Read on to enter the giveaway. 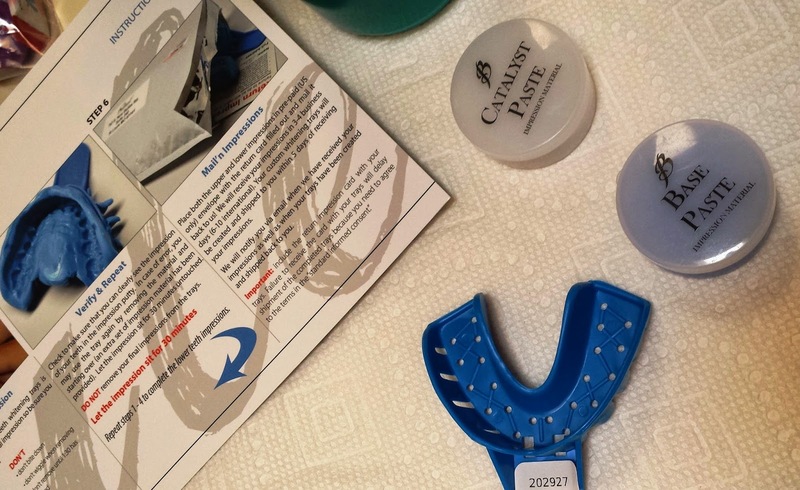 A SmileBrilliant kit gives you all you need -- including very clear instructions -- to have your own trays made by a professional dental lab that does the same work for dentists who don't have their own lab. I was a little nervous but the instructions were very easy to follow. 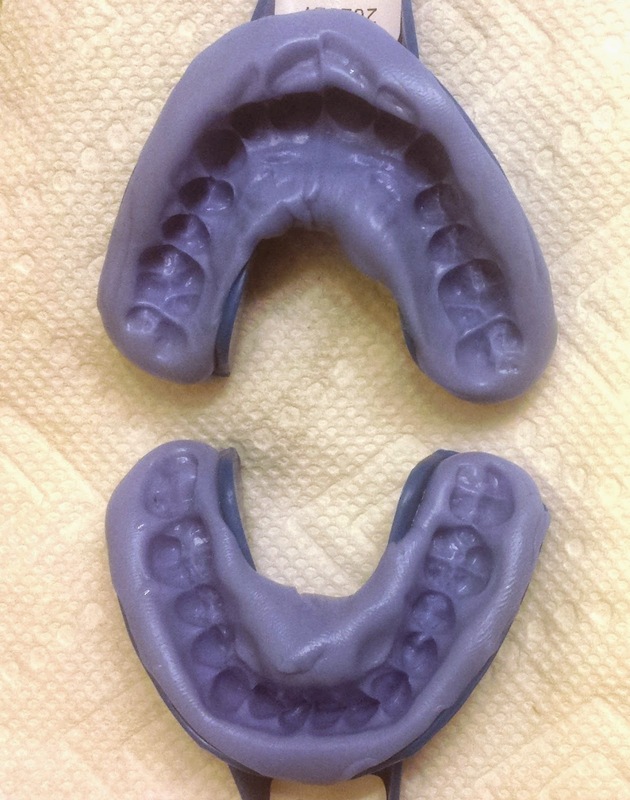 I was surprised how little time was needed to make dental impressions just like the professionals do. 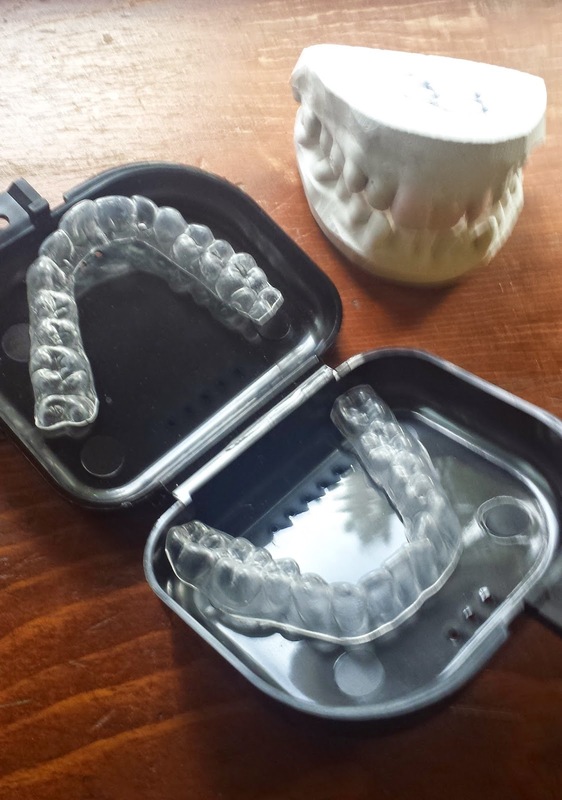 Within minutes I had made my own dental impressions. I popped the impressions into the mail in the envelope that was included and waited just a few days. Soon, I received these. 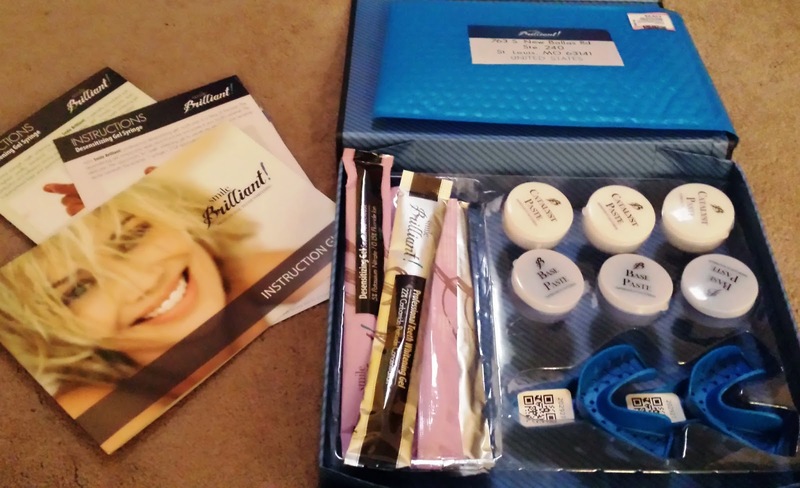 The kit comes with desensitizing gel, which I apply to my teeth via the trays just prior to whitening. I rinse that out of the trays, dry, then put a thin strand of gel into the trays. Hint: To make the gels last a bit longer, I treat only the teeth that show when I smile and only the front side of those teeth. Why whiten those ones in the very back? I've not yet gone through one of the three applicators, and already I can see a difference. Make sure to leave your email in some way so I can contact you if you win. Enter by midnight September 24, 2014. As I said above, visit SmileBrilliant's articles and tell me which title is most interesting to you. The randomly-chosen winner will be announced her the following weekend and I'll try to contact the winner (if I am unable to reach you after several days, I'll draw another name randomly). Bonus chance: Visit Mom In Management for more chances to win! Disclosure: I received a sample for purposes of writing an honest review. Something I'd love to have! I loved the article on if tooth whitening damages tooth enamel. Great explanation as to why "SmileBrilliant" is BEST! This is something I have always wanted to try! Thanks for the chance to win! I'd love to try these. I found the article Professional Teeth Whitening: Is it worth it and are there equal alternatives? interesting. I'm a coffee drinker, this is a product I could certainly use.. I liked the title about if teeth whitening ingredients damage the enamal and the title about the de-sensitizing gel. I have had concerns about the safety to my enamel and my gums have gotten sensitive in the past. Can you enter twice? OR possibly one time for every tooth in my mouth? Thank you, Lori, for letting us know about such cool products!